Ethiopia’s north central part along the Addis Ababa-Dessie road is reduced to a conflict zone after a group of armed groups opened war on residents in several towns. The conflict has caused road closure to and from Dessie, Kombolcha, Debresina and Debre Berhane towns, among others, according to an army officer in the office of Deputy Chief of Staff, as reported by Fana Broadcasting Corporate. The officer, he is identified as Colonel Tesfaye Ayalew, told the news sources that the defense force is now working on opening the road closures and restoring calm to the towns affected by the armed groups whose political identity is not disclosed by the Federal or regional government. Sources in social media with links to the region affected by the security crisis claim that the armed groups are militant wings of Oromo Liberation Front (OLF) who claimed to have separated from the political leadership of the radical Oromo ethno-nationalist group. Ibsa Dawud led Oromo Liberation Fron (OLF) has issued a statement distancing itself from involvement in the security crisis while the armed group that launched the attacks, including in a church, has also stated that it will no longer accept order for the political leaders of the organization. Deputy Head of Amhara Region Communications Affairs, Melaku Alamerew, who spoke to Amhara Mass Media Agency on Sunday, said that the cause of the conflict has a lot to do with groups who are working on old agenda and the objective is to broaden difference between ethnic Amhara and other communities in the region. According to Melaku, the armed groups, who are waging wars in the regions between Ataye (also known as Sebete) to Kemissie which is within Amhara regional state but with special zone status on grounds of language rights, also intend to make the conflict appear like religious one. However, Melaku did not name of the armed groups. A video footage widely shared on social media shows the armed groups ransacking and plundering Ethiopian church in the region. Members of Ethiopian Defense force were in the region shortly after security problem broke out in the region on Saturday around 3 p.m. local time. Solomon Altaye, administrator of Efrata district in the region, told AMMA that heavy gunfire was heard until 9:00 p.m. The armed groups are highly organized and have employed group weaponry and explosives apart from individual assault rifles like AK 47. Karakore, Kore Meda, Kara Legoma, Lala and Ataye are affected by the security crisis. Dozens of people are believed to be killed and dozens reportedly taken captives by the armed groups. Exact number seem to be unknown currently. 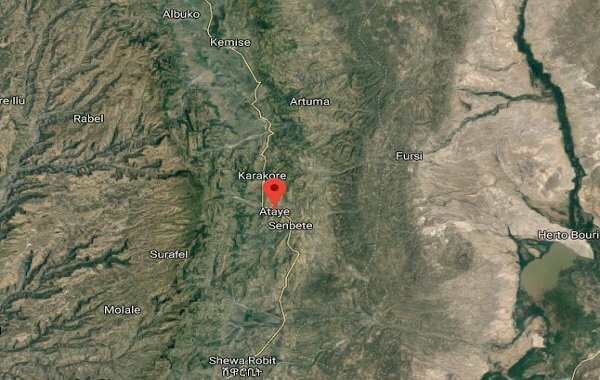 Getachew Bekele, Mayor of Ataye town, said the conflict was between “residents and armed groups” and 9 people have been killed since Saturday, and three people taken hostage, as reported by Ethiopian Broadcasting Corporation (EBC). There is also a report that a branch of Ethiopia’s bank in the town is looted. On Sunday, residents of Debre Berhane, about 120 kilometers north of Addis Ababa, took to the street to demanding government to protect residents in the region. Ethiopian National Security Council has issued a statement today, days after war by organized groups caused much damage, regarding the security crisis in Amhara regional state along the Addis Ababa-Dessie road and other parts of the country. “Loss of life in Kemise and the region is not acceptable …citizen’s safety and enforcing the rule of law is the prime function of government that will not be up for negotiation. Relevant Federal and regional security authorities are given order to take necessary legal measures,” said the statement. It also said that those involved in the orchestration of the conflict and the responsible for loss of lives and destruction of properties will be held responsible. Although some politicized Ethiopians tend to see hands of foreign powers in the destabilization of Ethiopia, radical ethnic politics brought about enormous political and security problems to the country as radical ethnic groups are contesting for ethnic land and power. On Friday, Ethiopian government admitted that ethnic politics constitute the greatest national security concern, rightly and in many ways.